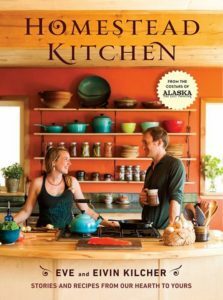 The first cookbook from Alaskan homesteaders Eve and Eivin Kilcher features appealing recipes for anyone looking to live more sustainably, healthfully, and independently, no matter where they call home. Homesteaders by choice, the couple has had to use their self-reliance skills to survive harsh winters in the Alaskan wilderness and raise a thriving family. In their debut book, the Kilchers share 85 original family recipes and advice on gardening, preserving, and foraging. The tips and techniques they have cultivated from their family and through necessity will help anyone looking to shrink their environmental footprint and become less dependent on mass-produced food and products. Stunningly photographed in and around their handmade home and farm, Homestead Kitchen illustrates that taking on small-scale sustainable projects is not only possible in a suburban/urban setting, but ultimately a more responsible and gratifying way to live. To get a signed copy of Homestead Kitchen, please make your order from The Homer Bookstore. Do you want to receive special updates from Eivin and Eve? Sign up below to receive original recipes from Eve's kitchen, sketches and plans from Eivin's workshop, photos, audio clips, and other fun content just for subscribers.